Rolwaling is the east –west valley below Gaurishanker(7145m), Just south of the Tibetan border. This is an Isolated and culturally diverse area. This trek is also very popular to see the Tsho Rolpa Lake , which has formed in new shape since a decade. It is a Ice lake. 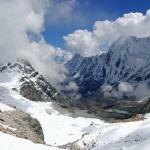 The Tashi Lapcha pass, is the dangerous and very exciting pass on this trek. It is like a peak climbing adventure. This area is very remote and most of the things for trekking must arrange from Kathmandu . This trek, starts from Barhabise, nearly one day drive from Kathmandu and ends at Charikot, Dolakha. Day 01 : Arrival in Tribhuwan International Airport , Kathamndu. Then transfer to hotel. Rest. Day02 : Full Day Kathamndu Valley city sightseeing, Visit Kathamndu Durbar Square , Monkey Temple , Pashupatinath temple, and boudhanath stupa. Evening back to hotel and trekking arrangements. Day 03 : Drive to Barabise, then trek start to Kabre. Day 04 : Kabre, trek to Dolongsa. Day 05 : Dolongsa, trek to Tinsang Pass. Day 06 : Tinsang Pass , trek to Chilangka. Day 07 : Chilangka, trek to Nathale. Day 08 : Nathale, trek to Simigaon. Day 09 : Simigaon, trek to Sakpa. Day 10 : Sakpa, trek to Nyimare. Day 11 : Nyimare, trek to Beding. Day 12 : Beding, trek to Yalung Ri . Day 14 : Yalung Ri , trek to Sangma. Day 15 : Sangma, trek to Tsho Rolpa. Day 16 : Tsho Rolpa, trek to Drolambao. Day 17 : Drolambao, trek to Trashi Labtsa. Day 18 : Trashi Labtsa, trek to Thame Gompa. Day 19 : Thame Gompa, trek to Namche. Day 21 : Phakding, trek to Lukla and the rest. Day 22 : Lukla , fly back to Kathmandu , then transfer to hotel. Day 23 ; Kathmandu , free and easy day, shopping and rest. Day 24 : Final departure for your onward journey.